Nature's Miracle™ Just for Cats™ High Sided Litter Box prevents messes and provides your cat with a clean and healthy litter box environment. Antimicrobial product protection and 2-in-1 odor control work together to inhibit odors caused by bacteria. Our high-sided design keeps your cat from scattering litter and features a non-stick surface that eliminates litter caking and odor buildup for fast, easy cleanup. Maintenance of your cat's litter box is made even more stress-free with our easy pour spout that allows you to change litter quickly and efficiently. Fill litter box 2"-3" high with litter. Add more litter as necessary to maintain depth of 2"-3". Always wash hands thoroughly after handling used litter. Since many cats dig holes, litter may spill over the sides of your litter box. To avoid this, use a scoop to grade the litter so that it slopes up on the corners and side of the litter box. 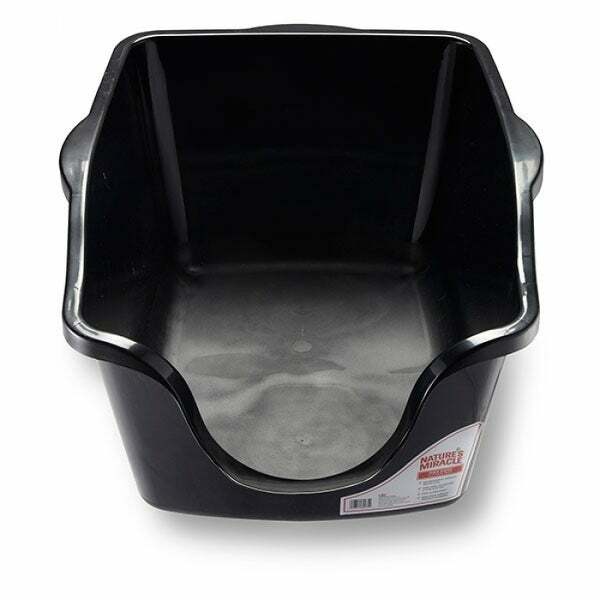 This will maximize the depth of the litter where the cat urinates most frequently and allow absorption to occur before the waste reaches the sides or bottom of the litter box. NOTE TO PREGNANT WOMEN AND IMMUNE SUPPRESSED-INDIVIDUALS: CAT FECES CAN SOMETIMES TRANSMIT A DISEASE CALLED "TOXOPLASMOSIS." ALWAYS WASH HANDS THOROUGHLY AFTER HANDLING USED LITTER.